Police are calling the actions of two Missouri men who allegedly threw eggs and hurled racial slurs at African Americans in south St. Louis a "hate crime," KSDK reports. Jesse Reed, 30, and David Ragain, also 30, were arrested late Friday and charged with assault motivated by discrimination in the third degree, the station notes. "A white van occupied by two white males approached the bus stop, started yelling offensive, hateful language motivated by race at [a victim]. Officers were quickly able to work with the real-time crime center to identify a van, identify a plate and find the two occupants," St. Louis Police Chief Sam Dotson told the station. People who frequented the bus stop said that they were tired of being targeted in the attacks, which have reportedly been going on for months. 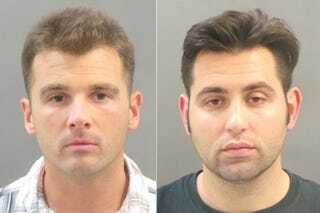 "These weren't two white teenagers on a joy ride," the chief told the St. Louis Post-Dispatch. Both men are being held on a $20,000 bond. Police told the Post-Dispatch that the two men hurled slurs and threw eggs at a black woman waiting at a bus stop around 11 p.m. Friday. Other African Americans waiting at bus stops along the same route were also targeted. The men were found through video surveillance and license plate scanners. Police do not think this is the first crime of this type that Reed and Ragain have committed, and are asking those who may have been similarly targeted to come forward, the Post-Dispatch notes. Read more at KSDK and the St. Louis Post-Dispatch.